The skin problems like dark circles, wrinkles, blackheads are very common and every woman is looking for a quick solution on it. The cosmetic products that we use often promise to provide the desired results but fails to do so. Thus, it is very essential for your skin health that you go green. 1.Take 2 tsp of vinegar and 2 tbsp of cornflower in a bowl. 2.Mix it well and rub the paste on your blackheads using your fingertips for 10 seconds. 3.Remove the paste using warm water. 4.You will be surprised to see that your blackheads are gone! A smiling face often has to pay for the continuous muscle actions around the mouth. It is the most prone area to get affected with wrinkles. Follow the given steps to say goodbye to wrinkles instantly. 1.Take 750 ml of olive oil, 200 grams of beeswax and fresh marigold flowers in a container. 2.Heat the mixture on the low flame for 2 minutes and then keep it aside for overnight. 3.The next day again heat the mixture and stir it properly. 4.Now, your cream is ready, put it in a container and store in the refrigerator. 5.Use this cream every day on your face for 2 weeks and watch the amazing results. A sleeveless dress, that’s what you want to wear in a party. But avoiding it just because of dark underarms? Don’t worry her is a special remedy for dark armpits for you. Application of coconut oil regularly is a common remedy to remove dark armpits. Use any of the 2 processes to get rid of dark underarms. 1.Take 2 tsp of raw milk and mix it with 1 tbsp each of yogurt and flour. 2.Mix it well and apply it on your underarm skin. 3.Leave it for 20 minutes and then wash your skin with warm water. 4.The remedy will help you to reduce the discoloration in minimum time. 2.Add a pinch of turmeric to it and mix it well. 3.Apply the paste on your underarm skin and leave it for 15 minutes. 4.Wash off with warm water and use it regularly to ger rid of dark underarms. You can keep the dark circles at bay and reduce bags under the eyes instantly using this simple remedy. 1.Take 2 tbsp each of cucumber juice and lemon juice. 2.Mix it well and apply on the dark circles, then wait for 20 minutes. 3.Wash you face with cold water. Use it regularly to ger rid of dark circles. 1.Take a ripe banana and mash it properly. 2.Apply the paste on the cracked heels and leave it for 15 minutes. 4.Soon you will get smooth and healthy heels with regular application of this remedy. Early discolouration of hair is nowadays common among teenagers. Here are two best home remedies which will help you to get rid of white hair quickly! 1.Take 2-3 cloves of garlic and chop it properly. 3.Add some linseed to the mixture and store it in a glass jar. 4.Keep it in the refrigerator and consume the mixture before meals. 5.Use this remedy 2 times every day to treat the white hair issue. 1.Take a handful of curry leaves and boil it in 1 glass of coconut water. 2.Strain the water and allow it to cool down. 3.Rub the water and provide a gentle massage to your scalp 5 minutes before the hair wash.
4.Use this remedy before every hair wash to get rid of white hair. 1.Take 2 tbsp of lemon juice and soak a cotton ball in it. 3.Wash your neck with cold water and pat it dry. Later apply some moisturizer on it. 4.Use this remedy twice a day for 2 weeks and the dark skin will turn light. 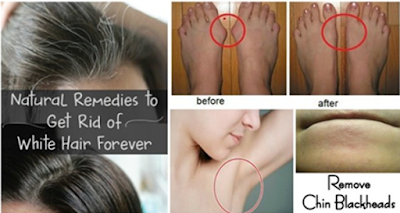 Try out this amazing and quick remedies. Do share it with your friends and let all women get rid of the nasty skin issues.